Years ago, my father —Â who loved to ride the Philadelphia trolleys — went looking for a trolley museum. He and my uncle came back laughing with reports of trees growing up between the trolleys. Today, the forest has grown more dense. 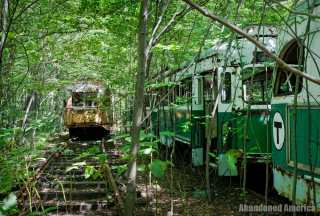 Abandoned America features evocative photos of our abandoned past including trolleys, planes, buildings and more. Enjoy!